The only permanent ice rink in Greater Manchester will close its doors for the last time on Sunday. Altrincham Ice Rink was put up for sale in 2001 and is now expected to be knocked down and replaced with housing. 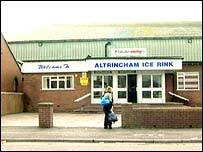 The rink, in Broadheath, has been home to the Altrincham Aces ice hockey team since it opened in 1961. Members of the original Aces team were joining players from the past 40 years for a final charity match at the Devonshire Road rink. Players also travelled from Liverpool, Blackpool and Bradford, as well as Houston, Spokane and Vancouver, to take part in the match. Meanwhile, a consortium is attempting to build a replacement rink in Altrincham. But it has not yet reached agreement with Trafford Borough Council.